1. Heat the oven to 120.c and line two baking trays with baking parchment. 2. Pour a little white wine vinegar onto kitchen towel and wipe clean a large mixing bowl (this gets rid of any grease which can affect the meringues). Place the egg whites into the bowl and beat using an electric whisk to form hard peaks, start adding the sugar very slowly, one spoon at a time. By the time all the sugar is added it should be thick and glossy white. The next part you need to do quickly, find a large metal spoon and get ready to stir – pour in the orange blossom water and quickly fold in using the metal spoon – don’t over mix as you will see the orange blossom starting to effect the meringue mixture. Take a dessert spoon and scoop out a large spoon full of meringue and carefully dollop onto the baking tray – space them out so there is 9 per tray. Sprinkle with the chopped pistachios and place in the oven. Cook for 40 mins – an hour. You want the meringues to be crispy on the top but if you pick one up and press underneath for it to be slightly softer – you want a good chew in your meringue. Take out and cool on racks, place in an air tight container and can be stored for a week. 3. Place the cream in a pan with the basil and vanilla bring to a simmer and gently simmer for 5 minutes, take off the heat and leave to cool and infuse for an hour or so. Pour into a bowl and discard the basil, add the honey and whip till it forms soft peaks. 4. 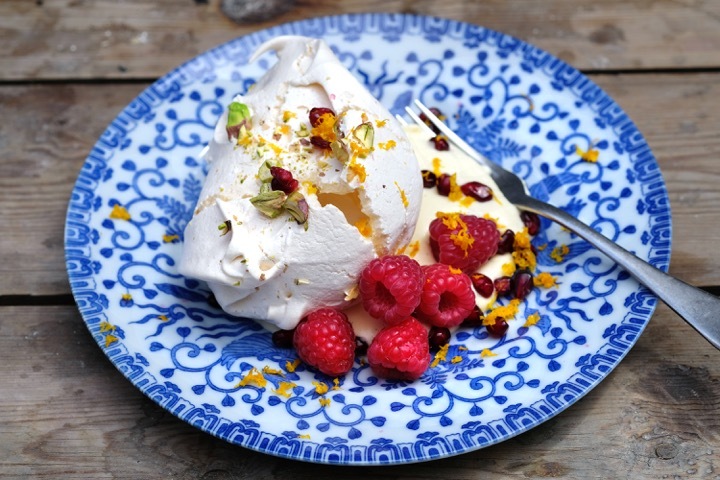 To serve take a spoon or two of the cream and dollop on a plate, place a meringue on top and scatter over raspberries and pomegranate seeds, finish by zesting an orange and sprinkling over and scatter over a couple of basil leaves.